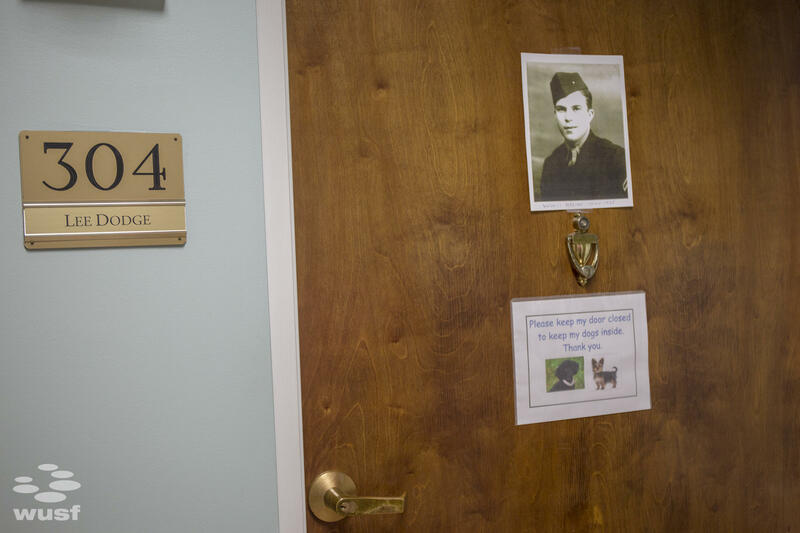 Lee Dodge, a 90-year-old World War II veteran, lives at Bridgewater, an assisted living facility at Waterman Village in Mount Dora. 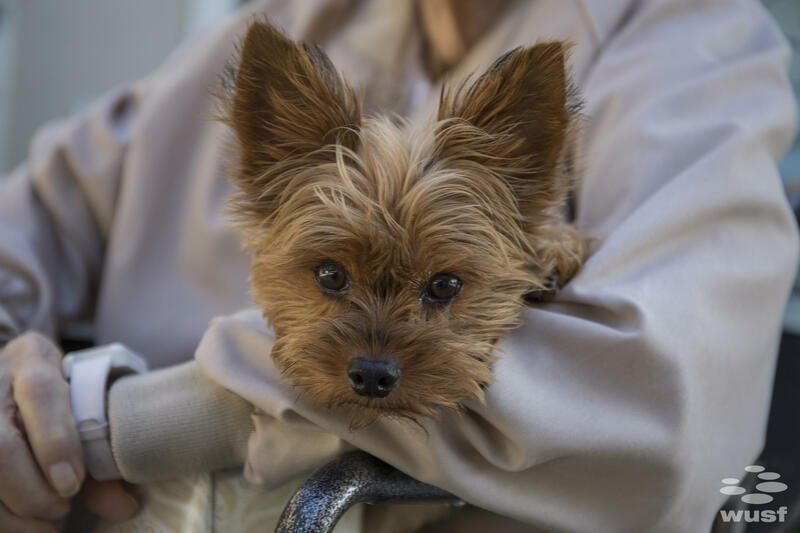 His hospice program has arranged for his Yorkie, Huey, to live with him. Dodge's door shows off his veteran pride, and Huey, his beloved Yorkie. Huey sits peacefully on Dodge's lap as he waits for a walk. After his walk, Huey finds his way back to Dodge's lap. Dodge and Huey enjoy the sun together. The dog barks as the door creaks open. Dodge is not ready yet, so she steps back out the hallway while he finishes dressing. A couple minutes later, Dodge's nurse wheels him into the hallway. His companion – 5-year-old Huey - now sits peacefully on his lap. 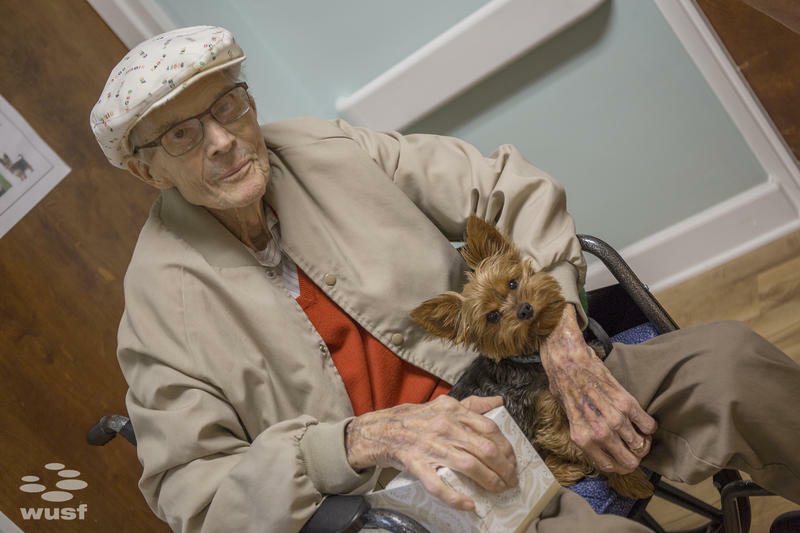 The World War II veteran has been at Waterman Village in Mount Dora since last fall, and his faithful companion hasn't left his side. But when it comes to Huey's daily care - Dodge needs help. So Otten comes out once a week, alternating days with other volunteers. Each time, she greets Huey with the same warmth and affection as his human friend. Otten coos at Huey, and pats his head. He sniffs at her hand. “I’m good,” Dodge answers. He’s not very conversational these days. As Otten snaps on Huey's leash, the 90-year-old man does something he's been known for all his life, but which he doesn’t do as often anymore - he breaks into song. "You're nobody ‘til somebody loves you..."
Not many nursing homes, assisted living centers or hospice programs allow pets. They're often more concerned about extra responsibilities, or funding. Someone has to pay for the pet's food and medical care, and the patient can't always afford to. 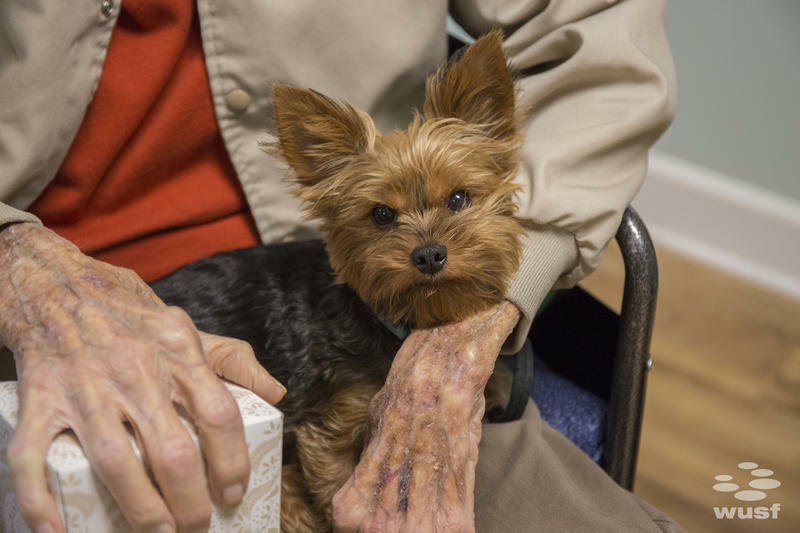 But Cornerstone Hospice & Palliative Care, which provides care to Dodge at Waterman Village, has partnered with an Oregon-based program called "Pet Peace of Mind." It helps more than 100 hospice and palliative care programs nationally care for their patients' pets. Florida has the most number of hospice partners at 11. (Click here for a state-by-state map). Pet Peace of Mind also provides start-up funding and training for their network of volunteers, like Otten, who walk, feed and play with the animals - as well as drive them to the vet or groomer. Otten lets Dodge know she's taking Huey for a walk around the facility. 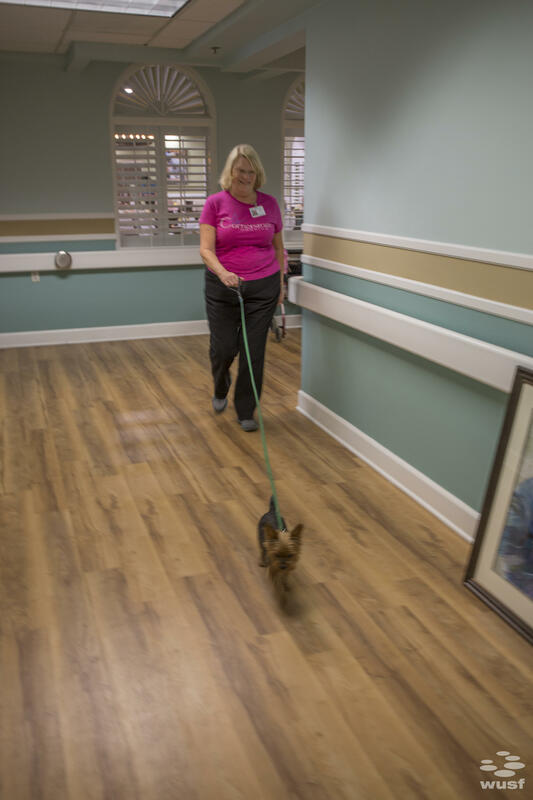 Pet Peace of Mind volunteer Shirley Otten walks 5-year-old Huey, a Yorkie, through the hallway at Bridgewater, an assisted living facility inside Waterman Village, a retirement community in mount Dora. As Otten begins walking Huey, she says it's nice to know programs like Pet Peace of Mind will be around if she needs them one day, too. "I think it's so wonderful that they allow them to have their pet with them,” Otten said. “It means an awful lot." Dodge's daughter, Lyn Hogrefe, lives in Ohio. She visits when she can, but setting her dad up with Pet Peace of Mind gave her a lot of comfort. She flew down and personally interviewed several of Huey’s caretakers to make sure they’d treat him with as much love and respect as the do their own pets. "Through a lot of love and effort and willingness to make sure my dad and Huey stay together, for the quality of life of my dad and for the love of Huey, we felt that this was just a really important endeavor,” Hogrefe said. Without a doubt, she said, Huey has improved her father's quality of life in a way that even medical care couldn't. “If my dad didn't have Huey, I don't think he would last all that long and he would just be so brokenhearted,” Hogrefe said. Dodge’s situation is a bit less common than many of the 1.6 million patients who received hospice services in 2014, according to the National Hospice and Palliative Care Organization. 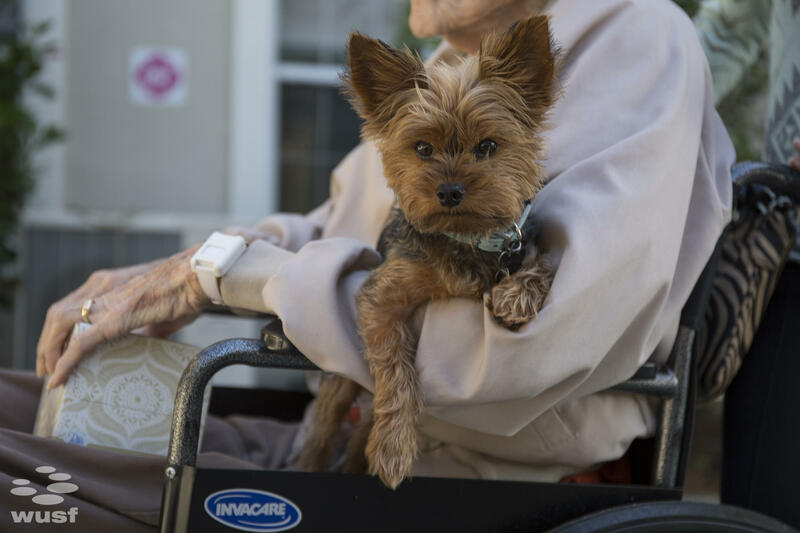 Pet Peace of Mind Founder Dianne McGill said most hospice patients receive care in their homes, not at an assisted living facility or nursing home. So there’s little concern about hygiene, or other patients being allergic to pets. For those who are like Dodge, the hesitation toward welcoming pets is decreasing every day, McGill said. Kristine Murtz is the Pet Peace of Mind manager for Cornerstone Hospice, which implemented the program in 2011. "We were the first in Florida to have the Pet Peace of Mind program and as you can see with Mr. Dodge, he would be lost probably without that dog,” Muertz said. “So we want to make sure that the two of them stay together as long as possible." But, she said, patients eventually die. When that happens, their pets often end up in overpopulated shelters, so Pet Peace of Mind volunteers help them make a contingency plan for the inevitable. "We plan for our estate, we plan for who's going to get this lamp and who's going to get the house, but we forget about these living beings that are mean so much to us,” Muertz said. 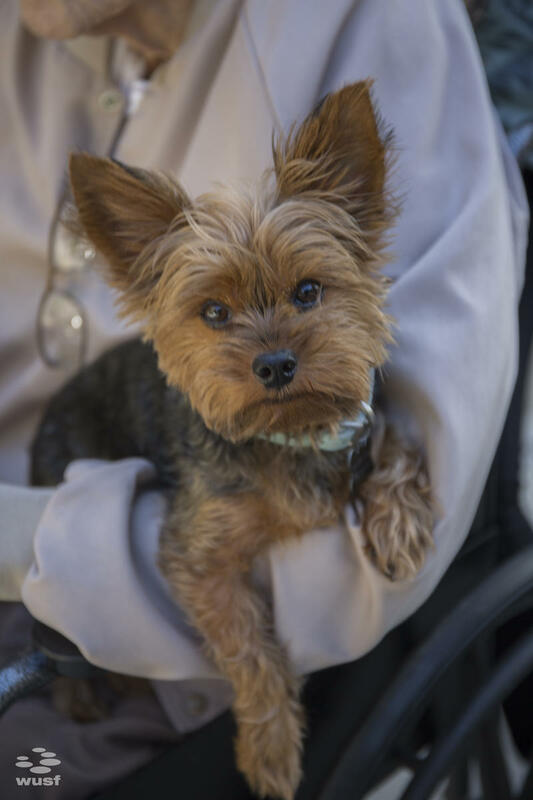 As far as Huey goes, when Lee Dodge's time comes, an employee at Waterman Village has agreed to adopt the mild-mannered Yorkie. For now, volunteers like Shirley Otten help with Huey's day-to-day needs -- like walks. At the end of his walk, Huey rests his head on Lee Dodge's arm. At the end of today’s walk, Huey makes his way back to his owner, who is waiting for him outside the facility. "He did poop so we're all set,” Otten tells Dodge. “Good boy!” she tells Huey. Huey rests his furry chin on Dodge's arm. The man is so happy to have his companion back in his lap, that he breaks into song again. "You may be a queen, you may be a king..."
The House is advancing a measure making it easier for patients to access hospice care.